Hello, dear readers. 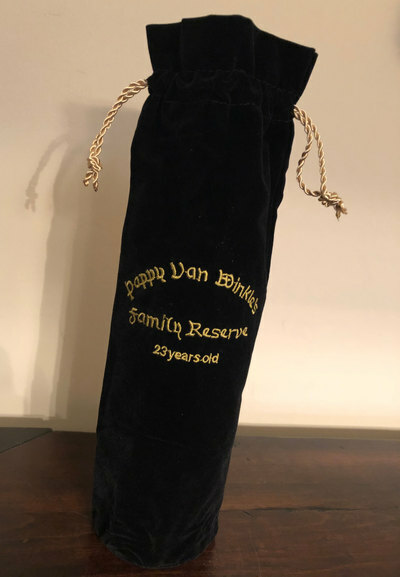 You might not know this, but Pappy Van Winkle's Family Reserve is officially and irrevocably the best bourbon in the world. And the expression that's been aged for 23 years is older, and therefore unquestionably better than all the other Pappy bourbons. If you don't believe me, go and consult any of the approximately one million internet lists that definitively rank all the bourbons, or maybe you can check with a whole host of celebrity chefs or journalists on social media. I mean, come on, if it's on Facebook and Twitter, what else do you need? It's absolutely unquestionable, is what I'm saying. As a result, anything with even a whiff of the Van Winkle brand is hyped to the gravitational levels of Sagittarius A* (the supermassive black hole at the center of the Milky Way Galaxy). 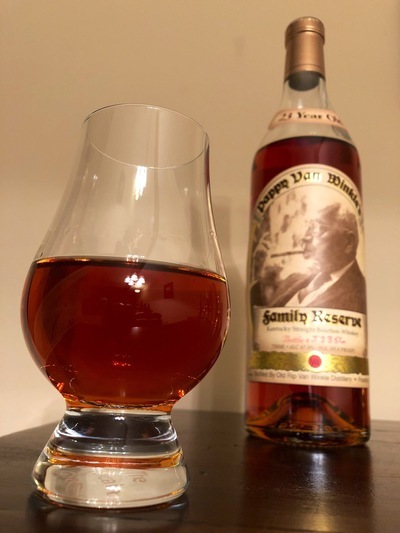 Once the Pappy juice itself became scarce, some folks took to saying things like hey, Weller 12 is basically the same stuff, it's just aged in a different part of the warehouse. Gravitation took hold, and now any bottles with the name Weller on it have gone missing. Pappy, the bourbon so famous that nothing, not even light, can escape it's gravitational pull. Here in PA, though, they do a statewide lottery for the Pappy release. This may be the one good thing about the PLCB, as they get a decent number of bottles and the lottery method is fair, if unpredictable. I've probably entered 15 lotteries and won 2 of them, but it's hard to argue with snagging a bottle of Stagg or, most recently, the 23 Years Old expression of Pappy Van Winkle's Family Reserve. This is pricey stuff, even at cost, and it regularly reaches $2000-$3000 on the secondary market. 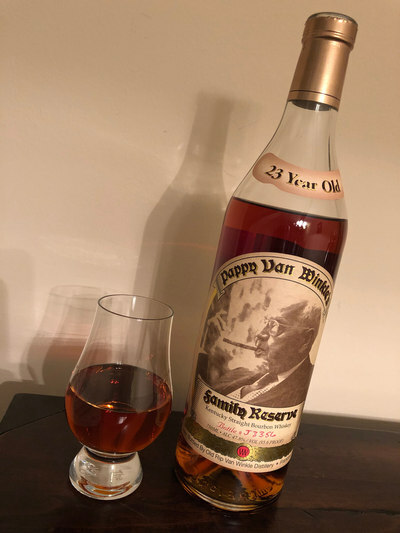 I suppose I could have just sold it, but my one and only taste of Pappy was the 15 a few years ago, and I'll admit, it was phenomenal. Not sure it's worth the insane black-hole-esque hype, but really fantastic stuff. You may not have noticed (despite watching me like ravenous hawks) that I've recently entered my annual beer slowdown (at least partly because I haven't said much about it, and also because I'm still working through a backlog of beer reviews), but if I've been avoiding beer of late, well, that gives me an excellent incentive to crack open something special like this. So what's the big deal here? Well, Pappy Van Winkle was an actual guy, and at some point in the 70s, his son started making bourbon and slapping his Pappy's picture on the label (that's him on the bottle pictured). Bourbon is made primarily with corn, but while most bourbons use rye as a secondary grain, Pappy uses wheat. I'm told that people who know what they're talking about call these bourbons "wheaters", which sounds good to me. Bourbon went through some booms and busts, and the original distillery (Stitzel-Weller) closed in 1992. Pappy, like the rest of the Bourbon producers, struggled for a while, but 10-15 years ago, things started to turn around. The thing with the boom/bust cycle is that during the bust times, bourbon producers have all this bourbon just sitting around in barrels, aging. So you end up with really well aged stock, which ends up getting released at a relatively cheap pricepoint, which people love (both price and taste), which then lends itself to the next boom. Stuff gets scarce, prices go up. Is another bust looming? Maybe. It's a hotly debated topic that I'm not really qualified to weigh in on... but "permanent boom" is a phrase I'd find suspicious. One other contributing factor to the Pappy mystique is that a lot of this bourbon was made back in the 80s at what is now a closed distillery. Man, do whiskey dorks love them some closed distilleries. As recently as 2013, Pappy 23 was using that original Stitzel-Weller juice. Alas, that appears to have been the last of it. What I have here was produced at one of Buffalo Trace's locations. Near as I can tell, it's still pretty damn well regarded. All during this most recent boom, though, Pappy was regularly recognized as the best of the lot (again, it's on the internet and that pretty-great TV show Justified, so it must be true), and the fact that they're still producing a bourbon aged for 23 years is pretty unique these days (most distilleries have long since sold through their aged stock and are running on NAS fumes these days). Bourbon Nerd Details: 95.6 proof, 47.8% ABV bottled (750 ml). Drank out of a glencairn glass on 3/30/19. Bottle #J3356. Vintage: 2018. All in all, I'm really glad I got the chance to drink this bourbon. I'm still not entirely sure it justifies the hype and concomitant price, but as a one-time splurge, I think it could be justified (note: I'm talking about the price at retail, not the secondary price, which is only worth it if you're filthy rich, and even then...) I will probably continue to enter the Pappy lottery, but I will not be putting in for the 23 year again... I suspect the 15 and 20 year expressions are the sweet spot (and even though I only had a small pour of the 15 a few years ago, I think it was probably better than the 23). This page contains a single entry by Mark published on April 15, 2019 10:11 PM. Suarez Family Brewing Qualify Pils was the previous entry in this blog.